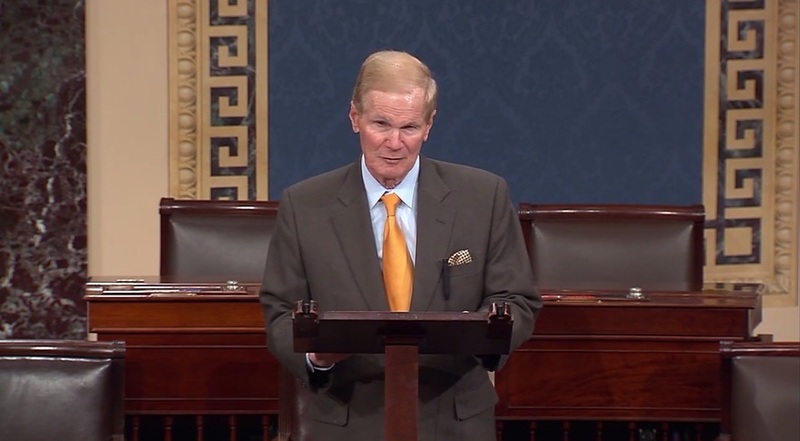 WASHINGTON — With both the current Congress and his political career nearing their ends, Sen. Bill Nelson (D-Fla.) said Dec. 10 he’s continuing to fight to extend operations of the International Space Station through the end of the next decade. In a speech on the Senate floor that will be one of his last in the Senate, Nelson said he and Sen. Ted Cruz (R-Texas), chairman of the Senate space subcommittee, were working to get an extension of the authorization of ISS operations passed before the end of this year. Operations of the ISS are currently authorized through 2024, a date that the other ISS partners have also agreed to. In the agency’s 2019 budget proposal released in February, though, NASA proposed ending direct funding of the ISS in 2025 as part of its effort to commercialize low Earth orbit operations, freeing up resources to support its lunar exploration plans. Nelson and Cruz strongly oppose any effort to end ISS operations in 2025, instead seeking to extend station operations through the 2020s. The station’s international partners would also have to back such an extension, something they said earlier this fall they were considering. Cruz introduced in July the Space Frontier Act, with Nelson as a co-sponsor, that among its commercial space regulatory provisions would also extend authorization of ISS operations through 2030. That bill was favorably reported by the Senate Commerce Committee in August, but is still pending action by the full Senate. A House bill, the Leading Human Spaceflight Act, would also extend the ISS authorization to 2030, but has not advanced since it was introduced by the House space subcommittee chairman, Rep. Brian Babin, Sept. 26. There’s limited time remaining in this Congress for those bills to win approval, with the next Congress set to be sworn in Jan. 3. That limited time available will be devoted primarily to more critical legislation, such as appropriations bills. Much of the government, including NASA, is operating under a continuing resolution that expires Dec. 21. Congress could start over next year and reintroduce those bills or similar measures, but Nelson will not be in the Senate to advocate for them. Nelson lost his bid for a fourth term in the Senate last month, losing to current Florida Gov. Rick Scott in a close race that required a recount. Nelson’s speech, lasting a little more than 20 minutes, primarily reflected on the changes in space policy during his tenure in Congress. That included development of NASA plans for human exploration beyond Earth as well as a strengthened commercial space sector that has increased launch activity at Cape Canaveral.